We're on a mission to make custom framing more convenient, intuitive and affordable. We do this by bringing the entire purchase experience online, handcrafting each frame to museum standards, and providing amazing customer support. Online framing is relatively new and still unfamiliar to many people. We're frequently asked how it works, as well as how Level compares to Framebridge, another online picture framing site. When you order a custom picture frame through Level, we handcraft the frame to your exact specifications and ship it out within a few days. It arrives with everything you need to mount the artwork on your own at home, a 15 to 20 minute DIY project. This means you don't risk sending away precious or sentimental items, and save time you would otherwise spend waiting for a mailer to arrive and making a run to FedEx. If you do prefer sending your items to us, we can complete the framing in our studio and send everything back ready-to-hang. Simply contact us, or place your order and note in the Special Instructions field that you would like to send in your artwork. We'll reach out to coordinate. Instead of a grid view of frame choices and the option to add a mat or not, we give you all of the controls to visualize and choose the exact frame style, profile width, mat color, mat width and even the type of acrylic glaze that best suits your artwork. 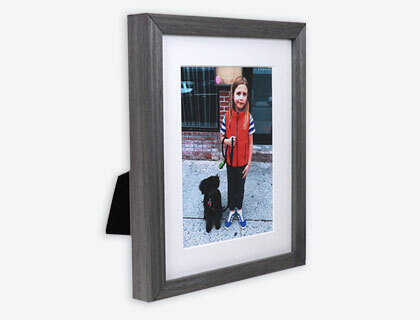 We believe this is the best way to design a frame that perfectly fits your artwork or photo and matches your taste. Not sure about which frame color or matting width to use? We've built guidance into the controls, like the ability to upload an image of your artwork inside the frame and a "Golden Ratio" button that suggests a balanced frame and mat width based on the size of your print. 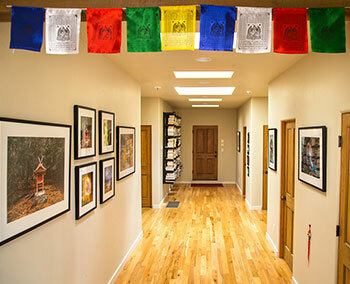 By cutting out any middlemen and producing everything under one roof, we are able to offer premium framing for a fraction of what you would pay at a high-end custom frame shop. The size of your artwork or photo helps determine the final price of your custom frame. But in our experience, there are wide differences in manufacturing cost based on the final frame specs you select. A 10" x 16" poster in a simple, black 3/4" wide profile is less expensive to make and ship than the same print framed with a thicker profile, 3.5" of matting and premium non-glare acrylic. 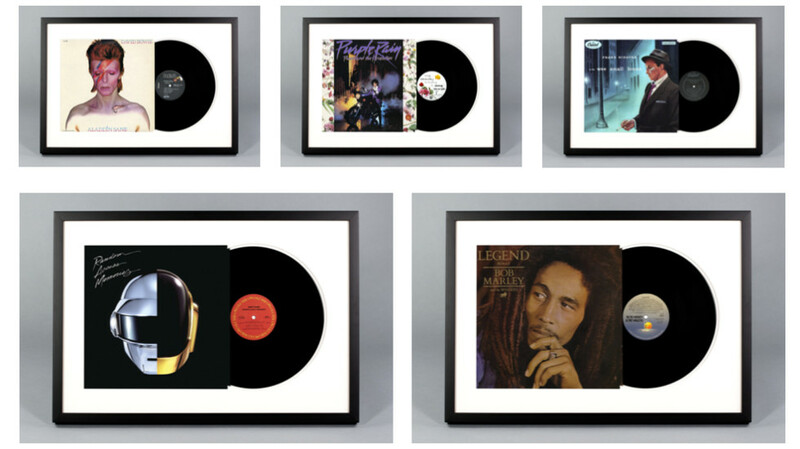 Level Pricing includes shipping costs for a single fame - orders with multiple frames are even less expensive. We price each frame so that you pay for exactly what you get - no more and no less - and to maintain a sustainable framing service built to last a lifetime, not a funding cycle. Instead of offering a sale every other weekend or random holiday, we've created a Rewards Program and a number of benefits for creating an account. - $15 when friends, family or total strangers use your unique referral link to sign up and purchase a frame. 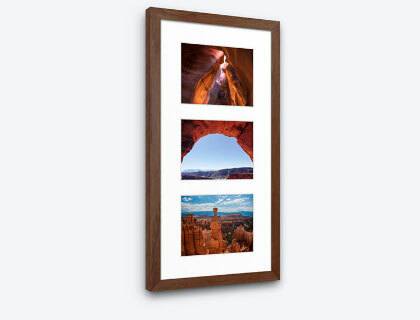 - $25 for every $500 you spend on framing with Level. - $20 when you tag us (@levelframes) in a photo of your frames AND we repost it on Facebook, Instagram or Twitter. Here's a a full review of the benefits that come with a Level account. If you reach out to us with questions, concerns or special request during East Coast business hours, an actual human (with a lot of framing experience) will reply, usually within a few minutes. We have a pretty good track record of responding to every chat, phone call or email with 24 hours. 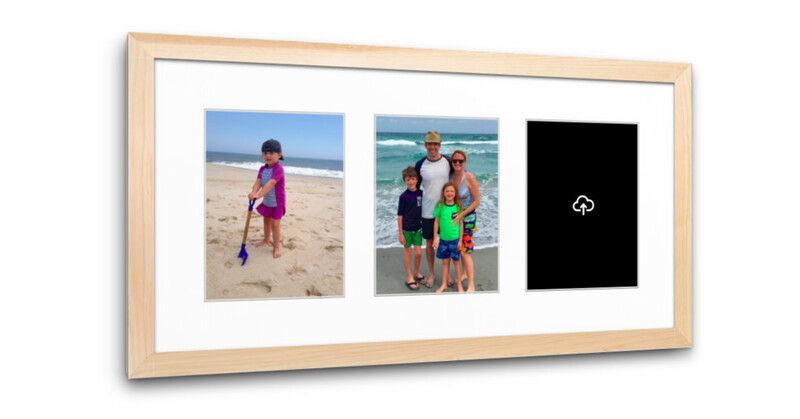 We're building new experiences around framing, including unique products that you can customize online for ultimate personaization. Create a Collage Picture Frame with up to five or your own photos. You pick the image size, orientation and frame style. 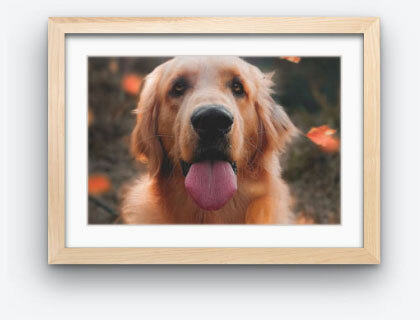 We'll print your photos, frame them inside separate mat window openings, and ship your creation within 3 business days. 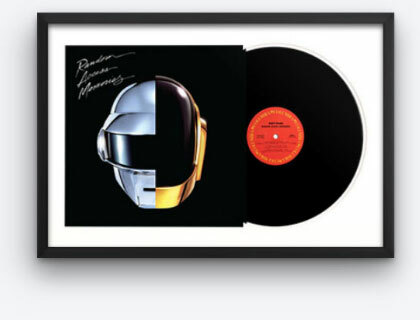 Or, let us track down your favorite album and turn it into a uniquely framed vinyl record. Browse our current selection of hundreds of titles, or let us know what you are looking for with a Tweet or by sending us a chat. Framebridge caps out on anything over 32" x 40." If you have an oversized item to frame, or want to print and frame something HUGE for your walls, we may have you covered. 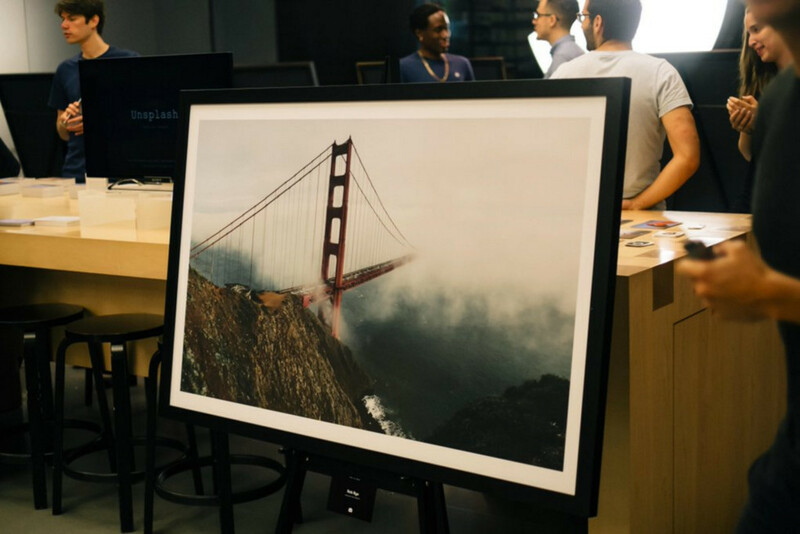 58" x 42" photos framed by Level for Apple - 1.25" black gallery profile and 2.5" mat. Anything larger than 36" does require some special attention, though, so we ask that you please fill out this form, or reach out to us directly via chat (lower right-hand corner) or at hello@levelframes.com to provide more details. You can also preview our guide to framing oversize artwork and photos on the blog. We own and operate a small fleet of high-end, professional grade ink jet printers, led by several brand new Epson SureColor P9000s. When you upload a photo for us to print and frame, we analyze the aspect ratio and resolution on the fly to generate a range of acceptable print sizes to choose from. You can also choose between a lustre paper that is slightly glossy, or an archival fine art matte paper that has a flat, texturized finish with little to no glare. Once a selection is made and your order placed, our software will resample the image up to 300 DPI for a super high-quality print. At this stage, we can see onscreen the exact print quality of each photo for the size ordered. If we spot any pixellation or noise, we will reach out immediately to request a higher resolution file or suggest a smaller print size. Once the photos are printed, they must pass a second eye test before we turn them into framed photos and send them your way. Reach out if you have any questions about the resolution of a photo or its max print size. We also offer image editing and retouching by special request. 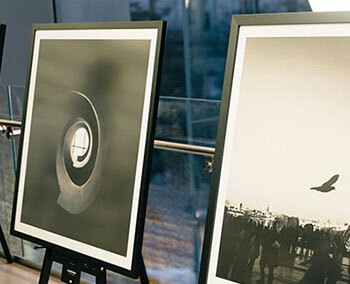 We've framed for many commercial photographers, interior designers, ad agencies, hotels, restaurants co-working spaces, offices and other types of business. Let us know if you are interested in bulk discounts, artwork curation, employee gifts, certificate awards, trade accounts or any of the other picture framing services for businesses we offer. 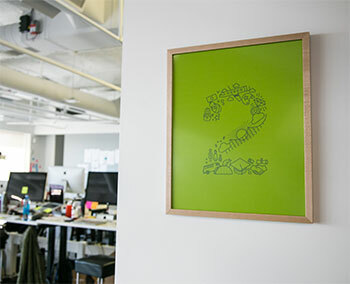 One of our favorite projects was helping Earnest, a new personal finance company, leverage the work of their in-house design team to decorate the walls of their office with amazing, company-themed illustrations. Learn more about how Earnest leveled up their office. 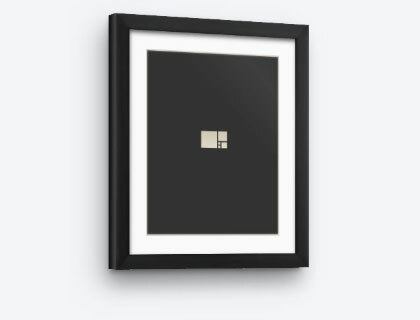 If it's not obvious, we love to frame and enjoy finding new ways to help people beautifully display and preserve artwork, photos and other items they love. Our goal is to help you on your next framing project, and many more to come. If you have a special request, specific mounting style, crazy question or challenging framing project, we can't wait to hear from you!